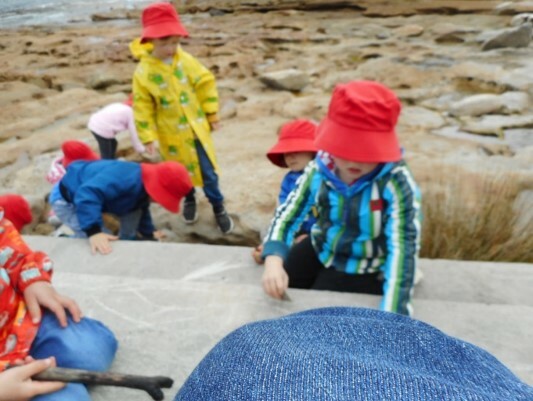 The Beach Kindy program at Clovelly began in 2013 after an inspiring session at an ECEEN (Early Childhood Environmental Educators Network) conference. The philosophy behind this is a direct reaction to the ‘bubblewrapping’ of children that has occurred over the last decade or more. Our aim is to support children to have a feeling of freedom, allowing children to take risks and be adventurous and facilitate the growing sense of place that is within most of us. 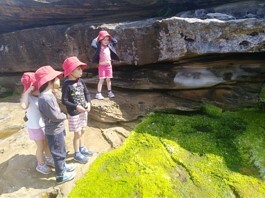 Using Clovelly Beach as the destination also allows children to become familiar with their local environment. They have met residents and shopkeepers and can recognise landmarks. They have developed a confident approach to climbing the rocks, crossing the road and dealing with different types of weather. As part of art projects in 2013 the Beach Kindy participants also created a number chart. This was constructed using photographs the children took while they were walking to and from the beach. The result was a wonderful chart using numbers spotted and photographed by the children. In 2014 the program continues and is supported by all the families. As one of the few programs of its kind in Sydney, it has attracted some attention from sector professionals including the Bush Connections course at Randwick TAFE and ECEEN themselves. We believe we have developed an excellent model for early childhood services that really does “get children out the gate”. It has also complimented the other practices and programs that we have here and the children’s learning is also ever present.